While a diamond set of armor has long been a status symbol within the game of Minecraft, even players who've been at the game for a while are bound to pick up some spare diamonds in their adventures. This particular mod was created with that surplus in mind, allowing you to upgrade your diamonds into even better gear.The Super Diamond Tools mod for Minecraft adds a variety of functions to diamonds by allowing you to upgrade them into Super or Ultra Diamonds that can then be worked into several superior tools and equipment. For When Regular Diamonds Just Don’t Cut It. The Super Diamond Tools mod for Minecraft adds a variety of functions to diamonds by allowing you to upgrade them into Super or Ultra Diamonds that can then be worked into several superior tools and equipment. Super Diamond. Many of the recipes in this mod require this particular item. To make one Super Diamond, you will need four Diamonds. Iron Stick. You will need to craft these instead of regular Wooden Sticks in order to create Super Diamond equipment. Stacking a pair of Iron Bars will give you a stack of 4 Iron Sticks. Super Diamond Tools.Tools and equipment constructed from Super Diamonds have a durability of 4,000; Diamond tools have a durability of roughly 1,562.Pickaxe. Efficiency of 40, diamond is efficiency 25.Sword. 50% deadlier than diamond.Axe. Nearly as strong as a sword and chops wood as good as the pickaxe mines.Shovel. Digs as fast as the pickaxe mines.Hoe. 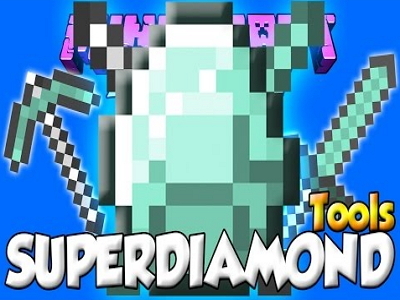 The one exception to super diamond’s durability, a Super Diamond Hoe has 10,000 durability.